Princeton University Press, 9780691095240, 456pp. Has globalization the phenomenon outgrown "globalization" the concept? In Distant Proximities, one of America's senior scholars presents a work of sweeping vision that addresses the dizzying anxieties of the post-Cold War, post-September 11 world. 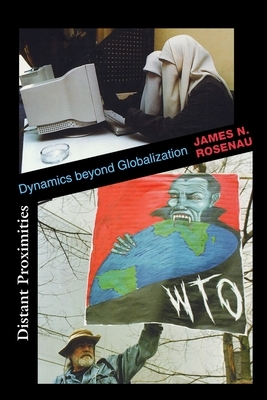 Culminating the influential reassessment of international relations he began in 1990 with Turbulence in World Politics, James Rosenau here undertakes the first systematic analysis of just how complex these profound global changes have become. Among his many conceptual innovations, he treats people-in-the-street as well as activists and elites as central players in what we call "globalization." Deftly weaving striking insights into arresting prose, Rosenau traces the links and interactions between people at the individual level and institutions such as states, nongovernmental organizations, and transnational corporations at the collective level. In doing so he masterfully conveys how the emerging new reality has unfolded as events abroad increasingly pervade the routines of life at home and become, in effect, distant proximities. Rosenau begins by distinguishing among various local, global, and private "worlds" in terms of their inhabitants' orientations toward developments elsewhere. He then proceeds to cogently analyze how the residents of these worlds shape and are shaped by the diverse collectivities that crowd the global stage and that sustain such issues as human rights, corruption, the global economy, and global governance. Throughout this richly imaginative, fluidly written book, Rosenau examines how anti-globalization protests and the terrorist attacks on America amount to quintessential distant proximities. His book is thus a pathbreaking inquiry into the dynamics that lie beyond globalization, one that all thoughtful observers of the world scene will find penetrating and provocative. James N. Rosenau is University Professor of International Affairs at The George Washington University. His numerous books include Turbulence in World Politics (Princeton) and Along the Domestic-Foreign Frontier.